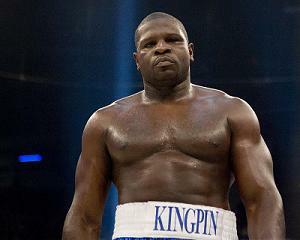 Heavyweight contender and former world title challenger, Kevin "Kingpin" Johnson (23-1-1, 10KO's), will be back in action this Saturday night when he takes on Julius "Towering Inferno" Long (15-14, 13KO's) in an eight round bout on the undercard of Saturday night's Pay Per View "Redemption In America: The Journey Begins Now" card, headlined by Evander Holyfield (43-10-2, 28KO's) defending his WBF Heavyweight Title against Sherman Williams (34-11-2, 19KO's) at The Greenbrier's Colonial Hall in White Sulphur Springs, West Virginia. Johnson, who had been looking to get a spot on the card for some time, but couldn't find an opponent to step up to the challenge , replaces Travis Kauffman, who pulled out of his bout with Long after coming down with the flu. Johnson, whose lone defeat came when he challenged WBC Heavyweight Champion Vitali Klitschko last December (L-12), is looking to move himself back to the top of the heavyweight world rankings in 2011, but he first must take care of the always dangerous 7'1" Long. Doors open at 6 PM/ET, first bout at 7 PM/ET, and first PPV fight at 9 PM/ET, 6 PM/PT. For more information visit www.integratedsportsnet.com.